My name is Ryan Parker and I will be the live case study for this linear periodised programme. As a 31-year-old male with a background in sport and fitness, I have recently hit many strength plateaus. My deadlift 1 rep max has been at 170kg for about 5 years (I think I’ve lifted 175kg once or twice in the past), squat has been at 130kg for at least two years and my bench has increased from 95kg to 100kg only recently having been stuck on 95kg for about 2 years. My body weight, fat and measurements have stayed roughly the same during this time. My lack of progress has been bothering me. Although now my job as a Marketing Executive for Human Kinetics is largely sedentary I still workout between 3-5 times a week. This situation will resonate with a lot of people in a similar situation. Have I got as strong as is physically possible, as strong as my God-given genes will let me? Maybe as I’m now 31 I simply can’t get the gains I got when I was in my early 20’s? Maybe my training has just been too random? Well, I’m going to put all this to the test, I’m going to strictly follow Brad’s Linear Periodised Programme taken from Science and Development of Muscle Hypertrophy. I get married in July 2019 and I want to be in the best shape of my life for the wedding and the honeymoon so my goal is to increase my strength and size in the 6-month programme before going on a bit of a pre-wedding cut. My training over the last 3-4 years has been rather concurrent (or perhaps even random). I play soccer once a week and usually hit the gym at least 3 times a week. I go through phases, predominantly I do HIIT type workouts or strength training, this usually revolves around powerlifting lifts and occasionally Olympic lifts. A couple of times a month I tend to do some endurance type work but these rarely consist of anything more than an hour of steady-state cardio, something like a bike ride or a run, such as parkrun which is a 5k run and takes me between 21-24 minutes. Most weekends I also go on long dog walks too. I also occasionally play badminton and tennis but this is getting less often, I haven’t even touched a racquet for about 6 months. I have, of course, gone through phases of typical bodybuilding bro splits. However, I’ve noticed I haven’t been able to add any weight to my big lifts for the last few years, despite doing regular heavy strength training. Brad Schoenfeld’s Science and Development of Muscle Hypertrophy, published by Human Kinetics. All measurements marked in inches, unless stated otherwise. More information in skinfold testing and the norms can be found on ExRx or MHHE. The power clean was included too, although it isn’t prescribed in Brads Linear Periodised Programme. I am not expecting any gains here but I feel it will be informative to see if my power does improve as my strength (hopefully) improves. The programme I have decided to follow (linear peridised) starts with a strength phase and ends with a hypertrophy phase. It is designed so that growth peaks at this time. I will be testing this theory by monitoring my body measurements as well as my strength. I actually really want to increase my 1RM but I have been strength training (heavy weights, low reps) for a long time (over 6 months) and I haven’t really been able to add any extra weight. So I am now trying this programme which starts with a strength phase, which is slightly different to how I usually train. The programme ‘peaks’ with a hypertrophy phase. Hypertrophy gains would be an added bonus but this type of training may also lead to strength gains. I’d like to increase my strength. I’m trying this linear periodised programme for hypertrophy as something a little different. It would also be nice to see me add an inch or so to my legs, chest and arms, but not around my abs! However, especially in the last microcycle (hypertrophy), I would like to increase my weight to somewhere between 82-85kg while still maintaining a similar body fat percentage. My relative strength has always been above average, so I will be happy to just maintain these as I will most likely increase my weight. It’s the 1RM’s that I really want to smash. However, after microcycle 2 I would expect my relative strength to increase a little. What is the Modified Linear Periodised Programme? Taken from Brad Schoenfeld’s book Science and Development of Muscle Hypertrophy a linear periodised programme is a scientific approach to strength and muscle hypertrophy (growth and increase of the size of muscle). This book has been one of the best sellers for Human Kinetics. It is one of the best strength training books and one of Human Kinetic’s most valuable academic books. So its easy to see why I chose this book for my programme. Having done a fair bit of research I think this linear periodised programme is the programme for me! Periodisation training is where an athlete or coach systematically plans training. The plan is broken up into phases and microcycles with the aim that the athlete should peak at the end of the final phase. It can involve tapering to peak for a one-off event. Or in my case, it involves a strength phase followed by a hypertrophy phase with a mixture of workouts and de-load weeks. The aim is to have maximum hypertrophy gains after that final cycle. An array of periodisation models have been proposed to maximise muscular adaptations to resistance training. Of these models, three have been studied with respect to their effects on muscle hypertrophy: traditional linear periodisation, nonlinear (undulating) periodisation and reverse periodisation. It should be noted that periodisation is a concept, not a defined system of training. Thus, there are virtually unlimited ways to structure a periodised programme based on a person’s unique needs and abilities. Given that all training variables can be manipulated and given the plethora of possible combinations of manipulation, the ability to draw practical inferences from research is limited. So although periodisation appears to maximise hypertrophy, multiple approaches remain viable options. Which is why the programme should help me as I’ve never really taken a scientific approach to a periodised programme before. As mentioned, I have chosen to do a linear periodised programme. The origins of this type of programme can be traced back to the 1950’s. Matveyev – a Russian physiologist, is widely credited with developing the traditional linear periodisation model to prepare athletes for Olympic competition. This was later further developed by Tudor Bompa who expanded and further organised the periodisation model. Bompa is also the author of the brilliant Periodization, 6th Edition. The linear model has three basic phases: the macrocycle, which encompasses an entire training period generally ranging from 6 months to several years; the mesocycle, which splits the macrocycle into at least two subdivisions lasting from several weeks to months; and the microcycle, which further subdivides the mesocycle into weekly phases focused on daily training variations. In the classic linear model, intensity and volume are inversely structured so that mesocycles progress from periods of high volume and low intensity to periods of low volume and high intensity. A typical three-phase linear mesocycle begins with a hypertrophy or muscle endurance phase in which intensities of load are 60% to 75% of 1RM (10 to 20 repetitions). Next is a strength phase in which loading intensities range from 80% to 90% of 1RM (4 to 8 repetitions). The final mesocycle focuses on strength and power by increasing intensities even further, approaching or exceeding 95% of 1RM (2 to 5 repetitions). Each increase in intensity is met with a corresponding reduction in training volume to accommodate the greater stress on the neuromuscular system. Ultimately, the person peaks at the end of the final mesocycle so that the training outcomes transfer to competition. Several studies have been carried out to determine whether periodising a resistance training programme enhances muscle growth, the detail of these studies can be found in Science and Development of Muscle Hypertrophy. Is linear periodisation better reverse periodisation? There are arguments stating that reverse periodisation is better for hypertrophy than the traditional linear periodisation programme. However, there isn’t much science comparing the hypertrophic adaptations of linear models to back up these arguments. Prestes et al (1) did a study in 20 trained young women and found that after 12 weeks there was an increase in fat-free mass with the linear periodisation group. That was enough to convince me to try the traditional linear periodisation programme over the reverse programme. Reverse periodisation has a hypertrophy mesocycle at the end of the macrocycle. However, although my goal is hypertrophy it is also to increase my strength so I liked the amount of strength work in the linear periodisation programme. What about an undulating/nonlinear programme? Nonlinear periodisation is thought to address inherent issues with the traditional model—namely, that progressive increases in load intensity do not allow sufficient time for regeneration. This places undue stress on the body over extended periods and increasing the potential for overtraining. Also, the hypertrophic gains obtained during the early phases of training are not well maintained because volume—a primary driver of hypertrophy is progressively decreased over the latter phases of the linear macrocycle. Nonlinear periodised programmes vary volume and intensity in an undulatory manner. A number of studies have been carried out on undulationg programmes the findings are also listed in Science and Development of Muscle Hypertrophy. Author Brad Schoenfeld concludes that both linear and nonlinear models of periodisation seem to be equally viable for maximising hypertrophy. In their pioneering work, Stone and colleagues (2) found that a periodised programme increased lean body mass to a significantly greater extent than a nonperiodised routine did. Unfortunately, the values for each group were not published, thereby precluding the ability to assess the magnitude of differences in the protocols. In a subsequent study, Baker and colleagues (3) failed to detect any significant differences in lean body mass between periodised and nonperiodised models; another study (4) showed greater absolute differences in favour of periodised training, but values did not rise to statistical significance. It should be noted that the two latter studies used the skinfold technique to evaluate body composition, which is of questionable accuracy for assessing relatively small changes in lean mass over short periods. So although there is some direct evidence to support the use of periodisation in a hypertrophy-oriented programme, the research at this point remains equivocal, precluding the ability to form definitive conclusions on the topic. I have also used the skinfold technique for measuring body fat as well as self-reported body measurements. The validity of anything self-reported is questionable but one thing which cannot be questioned whether or not this programme will help me lift more in the weight room. The calliper skinfold body fat measurement is still widely regarded as the most accurate, easy way to measure body fat. 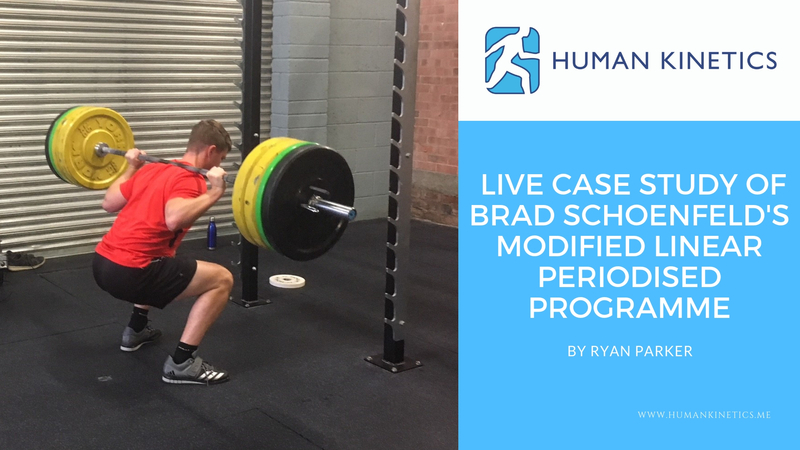 As Brad writes in his book, there is considerable evidence which shows that periodisation elicits greater gains in strength than nonperiodised approaches do. Given that mechanical tension is a primary driving force for muscle protein accretion, a case can be made that greater increases in strength alone would facilitate superior hypertrophic gains over time. This is slightly adapted from the recommended programme from Brads book to suit my lifestyle and the equipment available to me. Brads exact recommendations can be found in Science and Development of Muscle Hypertrophy and The M.A.X Muscle Plan. You may have seen some linear periodised programme’s which start with high volume, low-intensity training and gradually progresses to a lower volume of high-intensity work. This programme starts with strength into a short metabolic phase then into a long hypertrophy phase broken up into 5 microcycles within the hypertrophy phase. The hypertrophy phase in this programme illustrates a strategy for systematically increasing volume across a training cycle. This strategy can be used in both linear and undulating models. Microcycle 1 shows a 3-day-per-week routine in which all major muscles are trained in each workout session. In this scheme, training would generally be carried out on nonconsecutive days, I’m going for Mondays, Wednesdays and Saturdays; the other days are reserved for recovery. Microcycle 3 increases frequency to 4 days per week employing an upper-body/lower-body split routine. This type of routine is best carried out on a 2-on/1-off, 2-on/2-off basis. Although the training volume remains the same on a per-session basis, the total weekly volume is greater because of the higher frequency of training. Microcycle 5 increases frequency to 6 days per week employing a traditional bodybuilding-style split routine. Typically training in this type of protocol is carried on a 3-on/1-off basis. I will still do the occasional bit of cardio but it will be much less regular and when I do it will involve lifting and some sort of resistance, as written in The MAX Muscle Plan, cardio helps improve recuperation from heavy training. Very low-intensity dog walking will be regular. I will incorporate a HIIT workout on the rare occasion, as you can see I’ve thrown a few into the plan. I will not be doing any long distance running or much, if any soccer. However, I plan to stick to Brad’s linear periodised programme almost religiously! The Max Muscle Plan by Brad Schoenfeld, published by Human Kinetics. As well as the training plan I will also make some adjustments to my diet. I have to ensure I’m in a calorific surplus for hypertrophy. As described in Science and Development of Muscle Hypertrophy, Combining resistance training with an energy surplus enhances the anabolic effect: gains in a fat-free mass increase from 38% to 46% of the total weight gain achieved by sedentary subjects to as much as 100% in trained subjects. In a study of elite athletes (not that I’m an elite athlete, but I do train regularly), Garthe and colleagues (5) randomised subjects to a diet designed to provide a surplus of approximately 500 kcal/day or an ad libitum intake (ate when they felt like eating). All subjects participated in the same 4-day-per week hypertrophy-type resistance training programme, which was carried out over a period of 8 to 12 weeks. Results showed a greater increase in fat-free mass in favour of those in a caloric surplus versus those at maintenance (1.7 vs. 1.2 kg, or 3.7 vs. 2.6 lb, respectively), although the results did not reach statistical significance. Interestingly, the differences in fat-free mass between the groups were specific to the lower-body musculature, where a significant advantage was noted for those in an energy surplus. Greater increases in fat-free mass associated with the energy surplus were accompanied by an increased fat deposition compared to the eucaloric (Calories burned and calories gained are in a balance) condition (1.1 vs. 0.2 kg, or 2.4 vs. 0.4 lb, respectively). Thus, well-trained people appear to use less of the surplus for lean tissue–building purposes; a higher amount goes toward adipose (fat) tissue. It is not clear what, if any, effect an even greater energy surplus would have had on body composition changes. Beyond a certain point, overconsumption of energy has a negative impact on muscle growth. When macronutrient intake exceeds bodily requirements to maintain homeostasis and energy production for cellular processes, skeletal muscle can ultimately become resistant to insulin. In well-trained subjects, evidence suggests that a positive energy balance of 500 to 1,000 kcal/day is preferable for increasing fat-free mass. Contrary to what some may believe, untrained subjects can benefit from a substantial energy surplus. This is because untrained subjects have a higher hypertrophic potential and a faster rate of growth than trained subjects do, which accommodates more energy and substrate for building new tissue. So, my plan is to avoid being eucaloric, of course, but to gradually increase my intake of food. As you may know, the body needs three macronutrients, these are protein, carbohydrates and fat (lipid). Each macronutrient has different relevance from a hypertrophy point of view. Here is a quick breakdown of what is recommended and what I’ll be eating. Synomonius with muscle building. The recommended dietary allowance (RDA) for protein is 0.8 g/kg of body mass. However, as Brad explains in his book the protein needs of those seeking to maximize muscle size are substantially higher than those listed in the RDA guidelines. Lemon and colleagues (6) found that novice bodybuilders in the early phase of intense training required approximately 1.6 to 1.7 g/kg/day. This increased protein requirement is necessary to offset the oxidation of amino acids during exercise as well as to supply substrate for lean tissue accretion and the repair of exercise-induced muscle damage. The dose-response relationship between protein intake and hypertrophy appears to top out at approximately 2.0 g/kg/day; consuming substantially larger amounts of dietary protein does not result in further increases in lean tissue mass. There is even some evidence that protein requirements actually decrease in well-trained people. Optimal total daily protein intake depends on both energy balance status and body composition. Phillips and Van Loon (7) estimated that a protein intake of up to 2.7g/kg/day was needed during hypoenergetic periods to avoid lean tissue losses. However, my diet will be high in calories so this is not an issue for me. As I currently weigh 78kg (172lbs) I will eat at least 156 grammes of protein a day. This will come from eggs or a protein bar with my cereal every morning, a mixture of meats, fish and high protein vegetables or beans with my lunch and evening meal as well as some nuts and a protein shake post-workout to ensure I do not miss that golden window of opportunity. I will eat greek yoghurt some evenings if I feel I haven’t eaten enough. As my weight and training increases, I plan to add a little more. Carbs are essential for hypertrophy. Even though actually carbohydrate is not essential in the diet because the body can manufacture the glucose needed by tissues through gluconeogenesis. But for muscle growth, it is required. As much as 80% of Adenosine triphosphate (ATP) production during moderate-repetition resistance training is derived from glycolysis. Substantial reductions in muscle glycogen, therefore, limit ATP regeneration during resistance exercise, leading to an inability to sustain muscular contractility at high force outputs. In addition, a distinct pool of glycogen is localised in close contact with key proteins involved in calcium release from the sarcoplasmic reticulum; a decrease in these stores is believed to hasten the onset of muscular fatigue via an inhibition of calcium release. Studies have found that muscle glycogen depletion significantly decreased the number of repetitions performed in 3 sets of squats at 80% of 1RM. Similar impairments in anaerobic performance have been noted as a result of following a low carbohydrate diet. At the very least, it would seem prudent to consume enough carbohydrate to maintain fully-stocked glycogen stores. A minimum intake of 3 g/kg/ a day seems to be sufficient according to Brad Schoenfeld. Additional carbohydrate intake will be considered if I feel I require/want more. 3g/kg a day for me is around 234g a day. Although I haven’t really monitored my food intakes prior to taking part in the Linear Periodised Programme case study, as a rough estimate I would say I usually have around 234g a day anyway. I will gradually increase this. Most carbs will come from potato, sweet potato and rice. I will also have at least one cup of green tea a day and try to include other foods to help increase insulin sensitivity such as turmeric and garlic – I’m going to be a hit with my mates, work colleagues and future wife! two or more double bonds are called polyunsaturated fatty acids (PUFAs). This is explained in greater detail in Science and Development of Muscle Hypertrophy. Polyunsaturated fatty acids (PUFAs) are conceivably important for enhancing muscle protein synthesis and should be prioritised over saturated fatty acids (SFAs). A minimum of 1 g/kg/day of dietary fat appears sufficient to prevent hormonal alterations. I will go for around 1.2 g/kg/day = 94g a day, of which at least 2g will be from omega-3 fatty acids. The fat will be slightly higher than what is needed because I’ll snack on nuts a lot while at work. I currently eat between 2,500 -3,000 calories a day, I will gradually increase this. During the final hypertrophy microcycle I aim to be to eat between 3,800 and 4,000 a day. I will follow some of the meal ideas and plans from The New Power Eating by Susan Kleiner PhD and Maggie Greenwood-Robinson PhD. I will try to get most of my essential nutrients from eating a balanced diet. However, I have a few supplements on my radar. These include. I’ve cycled creatine in the past and I am a responder, it did help me increase size. I’ve never noticed much of an increase in strength though. However, numerous studies have shown creatine to be the best supplement for strength and size. Susan Kleiner writes about the benefits of creatine in The New Power Eating. I will most likely cycle it, having around 3 grammes a day for 7 weeks, then lay off it for 7/8 weeks and then start using it again throughout the hypertrophy phase of the programme at this stage I plan to have around 5 grammes a day. However, I will play it by ear and see how I feel. Vitamin D is actually a hormone. As this case study is taking place throughout winter I will not be exposed to much sunlight, hence my vitamin D levels will most likely be low. Numerous studies have found that athletic performance declines with low vitamin D. Muscle weakness is also associated with low vitamin D levels. Read more on why everyone in Britain should take Vitamin D.
Linked with improved sleep as well as an excellent exercise aid. Magnesium is often low in people who train a lot, I’ve never been tested for it but I am keen to keep my levels topped up, I intend on taking a magnesium supplement before bed on training days. A quick and easy way to get protein into my system after a workout is with a shake. If I do not have time to get a good quality meal in post workout I will ensure I have a whey protein shake. I will eat fish at least a couple of times a week, on the days which I do not eat fish I will supplement with a cod liver oil tablet high in EPA and DHA. Rest and sleep will be vital. Sleep helps increase insulin sensitivity and the ability to have the energy train. Dr Ian Dunican recently presented a webinar for us on the importance of sleep, titled Sleep and Performance: Time to Wake Up! you can watch this now, for free on the Human Kinetics website. I will be posting my workouts fairly regularly on the Human Kinetics Instagram page (@humankinetics) and my personal Instagram account (ry10pkr). There will also be regular updates on the European Twitter account (@HumanKineticsEU). Follow these accounts and see if the programme can help me increase strength and size as well as any ups and downs I encounter along the way. Feel free to follow and comment with any feedback. The aim is everything bigger, except my abs (which has got bigger but is marked as a minus figure as it has gone in the wrong direction, the goal is not to get a bigger waist). The results here are good, I’ve put on 2kg, without really changing my diet. My legs have got bigger, rather surprisingly my arms have grown the most, proving that big compound lifts will make everywhere grow. There isn’t much change in my body fat as a whole, which I’m pleased with. However, some of the results are a little surprising, having fluctuated quite a lot around the suprailiac and quads. I’m very pleased that all my big lifts have improved. The strict press has improved the most, this is probably because I’ve never done as much strict press as this programme prescribed. I do however train my deadlift, squat and bench a lot and I was hitting plateaus. To see all these increases even slightly is great. Given more time I’m confident I could have got 105kg on the bench press, I only attempted it once and couldn’t lock it out without my spotter helping, however, this was only around 4/5 mins after lifting 102.5kg. I didn’t attempt to squat any higher than 135kg. I had one attempt at 180kg deadlift but couldn’t lift it any more than a couple of inches off the floor, I started seeing stars and went home! I could only power clean 85kg, I failed at 90kg twice and didn’t try it again, as this was not part of the strength cycle, I’m not too fussed about hitting or surpassing my PB of 90kg. Not surprisingly my relative strength has only increased on the bent over row and strict press, as I have been doing these a lot more than usual. As I’ve only been doing reps of 3-5 or 8 my body was not prepared for high volume sets, hence the drop in relative strength for most of these exercises. Despite doing a lot of squats and bench, the heavy weights and low volume has led to a decrease in max reps. Another thing to note is the fact I was actually lifting more as I now weight 80kg and I was working out all the relative weights for 80kg, not 77kg as I did previously. The next phase which is metabolic should see these increase. The first thing I’d recommend is to find out your 5 rep max on all the big lifts. Don’t start guessing you’ll waste your time lifting weights too light or too heavy, I workout out my 5 rep max before I started the programme, however, I was training with a friend and it took him a few sessions to get the right weight for some lifts. Another thing I’d recommend is to get a spotter, I had a spotter which helped me push through the last rep on many occasions where I would have had to give up and not try the last rep had he not being there. Training with a friend also helps keep you on track and motivated. I enjoyed the first phase of the programme, in the past when I’ve just done strength training I’ve often lost focus and motivation. With this programme I didn’t. its simple, effective and I never felt overtrained or fatigued and I had very little sign of DOMs which is great. My cardio has dropped, I’ve only played 5 a side soccer a couple of times and I haven’t done any running and I’ve only been on the cardio machines in the gym to warm up. The workouts were longer than my usual sessions. I typically spend about 45-50 minutes in the gym. The sessions in the first microcycle were taking just over an hour, the split body microcycle sessions were taking about 90 minutes. The main limitation I had was getting to the gym, I sold my house halfway through the programme and my new house will not be ready until February. I’ve been living with my fiancée’s parents who live 26 miles away from my gym. The gym is also 15 miles away from my work so I’ve been covering a lot of distance in order to train. I only missed one session, I did have to rearrange a couple though because of work commitments and I also had a couple of weekends away. This resulted in back to back sessions and occasionally two sessions in a day to ensure I got them in. This isn’t recommended. This is during the hypertrophy phase but before the final 4 weeks of the 5:3 split. I didn’t do the strength tests but did my body measurements as I was feeling bigger than I had been in the past. The most surprising for me is the fact my legs grew two inches. I’m putting this down to not doing more leg work but varying the work. Although there were fewer deadlifts and squats compared to what I usually do (and my strength on these exercises didn’t actually increase) I put on size by including lunges and some machine work such as the leg press and leg extension. Perhaps less functional but helps increase size. I’ve written a post on machines v free weights (Free weights or machines? The science and the facts) which is well worth a read for more information. To be completed week commencing 6th May 2019. The only time in the programme I did not stick to it, unfortunately. So the results are not as great as they could have been. I simply could not make it 6 times a week. I went three times a week. I did shoulders and arms on Monday’s, chest and back on Wednesday’s and legs on Saturdays. I’m not one to make excuses but I moved house at the start of this microcycle and there was a lot of work to be done on it and I was very time poor. It also fell at a time where socially I had a lot on too so I committed to just three days a week which was achievable. In terms of putting on size, this is the best programme I’ve ever done. It was time-consuming but achievable (until the last microcycle but this was because of my personal circumstances.) If I had have finished the last 4 weeks I am confident I would have hit at least 88kg which as a 10kg increase since the start of the programme. I finished at ….kg but at my heaviest I was 85.5kg. To be honest, even 78kg which is what I was when I started is quite heavy for me. I’m usually between 76-78kg. My diet wasn’t as strict as I’d have hoped, I did increase my calorie intake and throughout microcycle 1-4 of the hypertrophy, I was having around 3 grammes a day of creatine. If I continued this and finished the programme properly then the gains would have been significantly greater. Post-summer I may do the hypertrophy programme again and see if I can hit 90kg but for now, I am now looking forward to getting my fast twitch fibres firing again and some more HIIT in time for the summer shred! Prestes, J, De Lima, C, Frollini, AB, Donnatto, FF, Conte, M. Comparision of linear and revere linear periodization effects on maximal strength and body composition. J Strength Cond Res 23: 266-274, 2009. Stone, MH, O’Bryant, H, Garhammer, J. A hypothetical model for strength training. J Sports Med Phys Fitness 21: 342-351, 1981. Baker, D, Wilson, G, Carolyn, R, Periodization: The effect on strength training of manipulating volume and intensity. J Strength and Cond Res: 8 235-242, 1994. Garthe, I, Raastad, T, Refsnes, PE and Sundgot,-Borgen, J. Effect of nutritional intervention on body composition and performance in elite athletes. Eur J Sport Sci. 13 295-303, 2013. Philips, SM and Van Loon, LJ. Dietary protein for athletes: from requirements to optimum adaptation. J Sports Sci. 29 Supp 1: S29 – S38, 2011.